Click Here To See Our Popular Items! Instigated 2005. Originally, the Stupidiotic brand was to be a simple line of novelty toys. While developing our own Stupidiotic product line, we kept finding more and more outside products that were as Stupidiotic as we could ever create ourselves. We then began to offer these Stupidiotic items on our Stupidiotic website. In 2007, we opened our first brick & mortar Stupidiotic retail store in Big Bear, California. It’s been a Stupidiotic mess ever since. 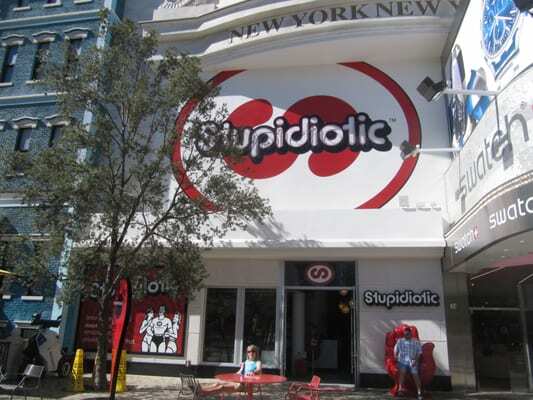 With our Las Vegas store, we’ve really dialed into the retail side of Stupidiotic. Featuring a wide variety of ingenious and UN-genius products and ideas. Some amusing. Some confusing. Most are genuinely thoughtful and sensible - in a Stupidiotic sorta way. Altogether, creating an interesting and unexpected retail shopping experience found nowhere else. This here Stupidiotic website procures and appropriates peculiar products for your purchasing pleasure. Peruse and ponder our penchant for “P” words. We’re continually scrolling and scouring the webs and the wide world for interesting, entertaining and often overlooked content. Sometimes we embellish or outright fabricate Stupidiotic things. We’re frequently adding new and un-proved products and perspectives. There’s always something to discover (or reevaluate) every time you visit Stupidiotic dot com. Stupidioticredo 1.0 - Not since the conjunction of “what” and “ever” has there been such an expressive expression. But Stupidiotic is more than a simple “stup-idiom”. It’s an elemental human condition. We’ve found that there’s not much in this world that isn’t Stupidiotic. Everything either starts out as Stupidiotic or ends up being Stupidiotic. Seemingly Stupidiotic ideas become brilliant innovations. Brilliant innovations eventually become Stupidiotic. Nothing escapes the Stupidiodyssey. We all actively pursue something Stupidiotic. Be it some half-baked idea or unrealistic objective. There’s always a sincere and hopeful spirit at the core of Stupidiotic things. It’s these sincerious Stupidiotic things we salute, celebrate and surrender to.